Note changes we made to clarify numbering of sites in A & B area. 3 more sleeping cabins are being built east of the 3 cabins we opened May of 2016. (The new cabins are open for booking for 2018 season.) A1 through A8 and A9 through A13 have been reconfigured. B3 & B7 have switched places. Lake view bank sites are B7, B8 & B9. G6 is now N9 and can be booked as a secluded regular site. 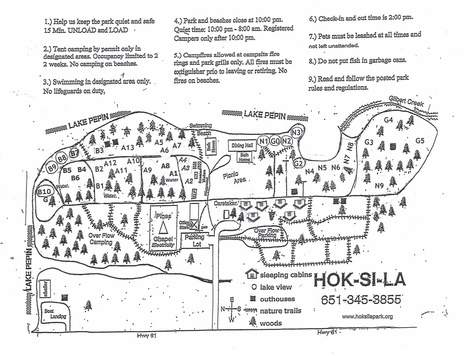 The map does not show that cabin #4 is directly across from G2. Outhouse are located across from the third sleeping cabin and in the woods between G4, G5 and N9. Questions or reservations call 651-345-3855.